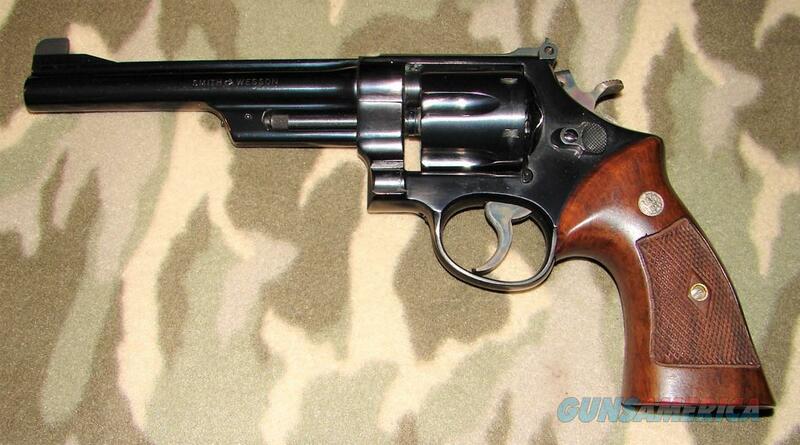 Description: Smith & Wesson Fourth Model of 1950 44 DA .44 Spl. S# S147342. 6 1/2" bbl. with an excellent bore. This 5 screw shrouded & pinned w/ rib revolver retains 98 -99 % of its original blue finish showing only a light drag line around the cylinder. Features include a patridge front sight w/ micrometer click adjustable rear sight. 6 Shot fluted cyl., colored case target hammer & serrated trigger are also in excellent condition. 2 Piece diamond checkered walnut target grips are period but not numbered to the gun. A big ole 5 screw“N” frame revolver in a very desirable bbl. length and caliber. There is no box or papers.